This post was sponsored by Alaska Seafood as part of an Influencer Activation for Influence Central, and all opinions expressed in my post are my own. 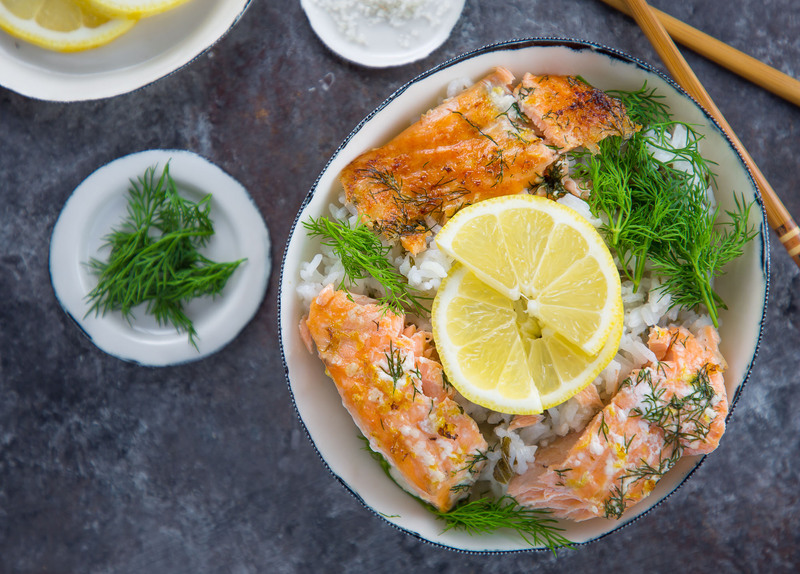 I am thrilled to team up with Alaska Seafood to bring you this baked Alaska king salmon with lemon and dill rice bowl recipe. Why Alaska Seafood though you might ask? Well, because all salmon is not created equal. Alaska Seafood utilizes sustainable practices and is an environmentally responsible company. Not only do they employ a nose-to-tail concept of harvesting (using 100% of the fish) they also set annual harvest limits based on studies of the local biomass. These restrictions ensure the sustainability of the Alaska fish populations for generations to come. It is our responsibility to do the very best we can to take care of our environment and be sure that our agriculture and fisheries are as sustainable as possible. I was fortunate enough to find fresh Alaska king salmon at my local fish market. I did scope out the freezer aisle of my local supermarket as well and found frozen Alaska Seafood too. 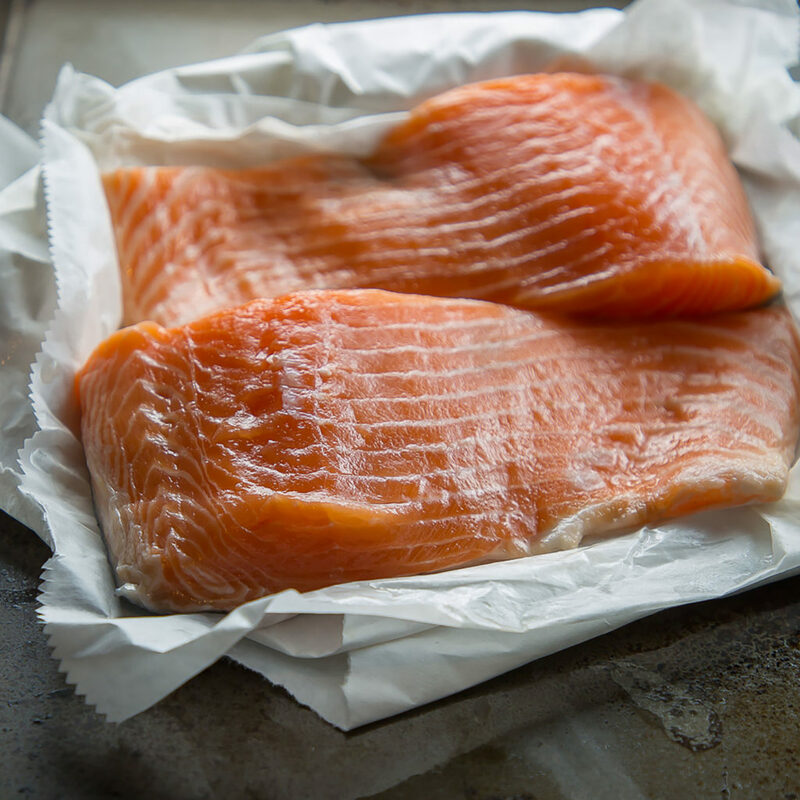 Fresh or frozen, Alaska seafood is the best option for your health. Avoid farm raised, mass-produced fish. Always reach for wild caught as these fish will be more nutrient dense because of their natural environment, activity levels, and healthier diet. Click here to learn more about Alaska Seafood and their sustainability practices. My family adores salmon. I serve some variation of the fish every week. In fact, it is recommended that you consume fish high in fatty acids 2-3 times a week. The fatty acids and omega’s in salmon make it an excellent choice. Filling your belly and reaping tons of brain healthy fatty acids? Count me in! My three-year-old LOVES salmon, and this is his absolute favorite way that I make it. So how do I make this baked salmon with lemon and dill rice bowl? First, obtain your Alaska salmon. If frozen, you will need to thaw in your refrigerator overnight. Preheat your oven to 375 degrees. While your oven is preheating, we need to start the rice. Combine 1 cup of rice, 1/2 cup chopped kale, and 1 3/4 cups of water in the Instant Pot. Cook on rice function. If you do not have any instant pot, cook according to the direction on the package. Timing should work out either way. The Instant Pot just requires less babysitting and effort so you can watch your fish more closely. Your rice should be ready. Fluff the rice with a fork and add the juice of 1/2 a lemon. Fluff more and spoon into a bowl. 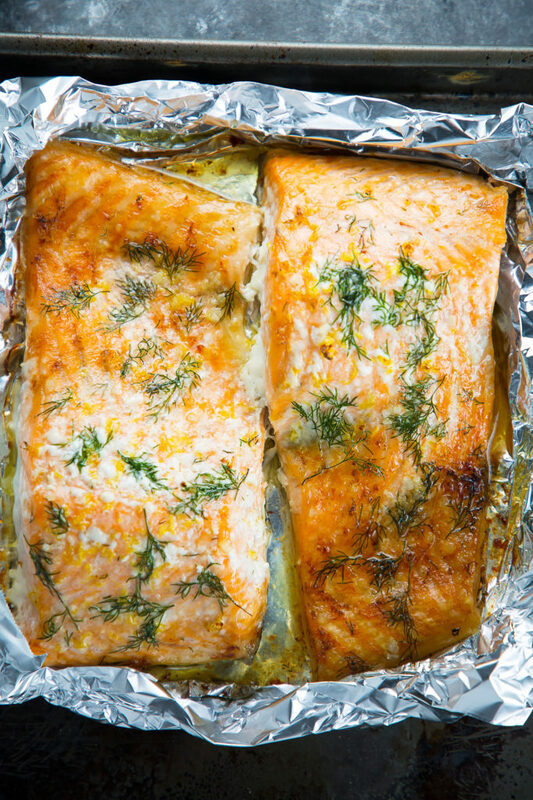 Top with large chunks of the baked salmon with lemon and dill. Add lemon wedges or slices and extra dill to the dish. If you desire, season with salt and pepper. Your rice bowl is now complete. 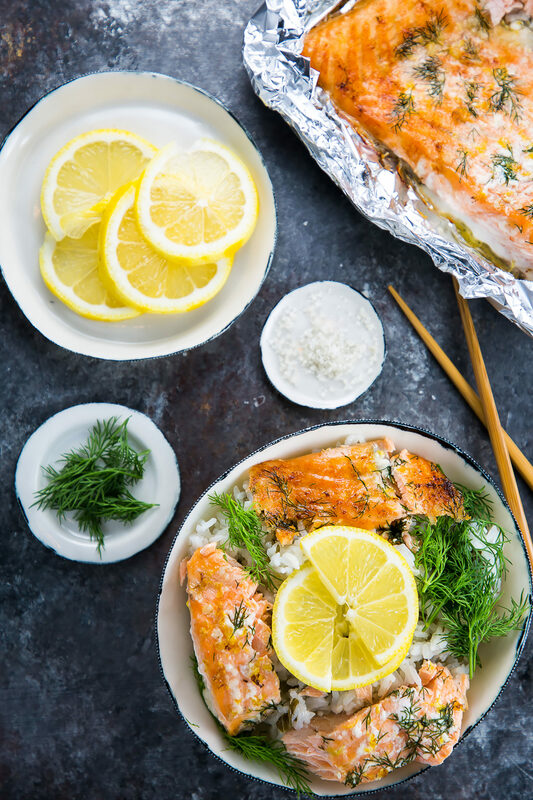 Dig in, and I hope you enjoy this baked salmon with lemon and dill as much as my family does! A deliciously healthy baked salmon with lemon and dill rice bowl. Cook under broiler for 2-3 minutes to get a golden brown "crust"
I am all for simple and fast yet delicious meals and this is a must try!! It looks soo good ! definitely pinning this for later to try! thanks! I do love Alaska salmon and this dish is perfect for my lunches. Thank you for sharing. King salmon is such a delicacy — we don’t find it often here in South Florida, but when I do — it’s on the menu! This looks like an absolutely mouthwatering dish — your photos are stunning! I love salmon! This recipe is perfection! This sounds amazing! I love salmon. It’s so tasty and healthy, and it doesn’t take as long to prepare as you would think. Salmon is so easy to make and yes, so healthy! This baked salmon looks so flavorful and Delish! Beautiful photos too! Sounds delicious! I have’t tried cooking salmon much but want to get more into it. Oh, you should! Salmon makes for such a quick easy meal! I’m always so intimidated by preparing fish, but you make it so easy! This looks absolutely delicious. Thank you for sharing! Don’t be intimidated 🙂 Fish isn’t hard to prepare, just find a few recipes to follow until you get the hang of it and tell when the fish is done. After that, the sky is your limit with the flavors! They really are! I hope you love the recipe! Salmon is one of my favorite dishes right now. I have some good pan seared recipes, but I love this baked recipe. It’s so flavorful. Yum! I always reach for Wild Alaskan salmon. It’s the best and love it with dill! rice bowls are my favorite! 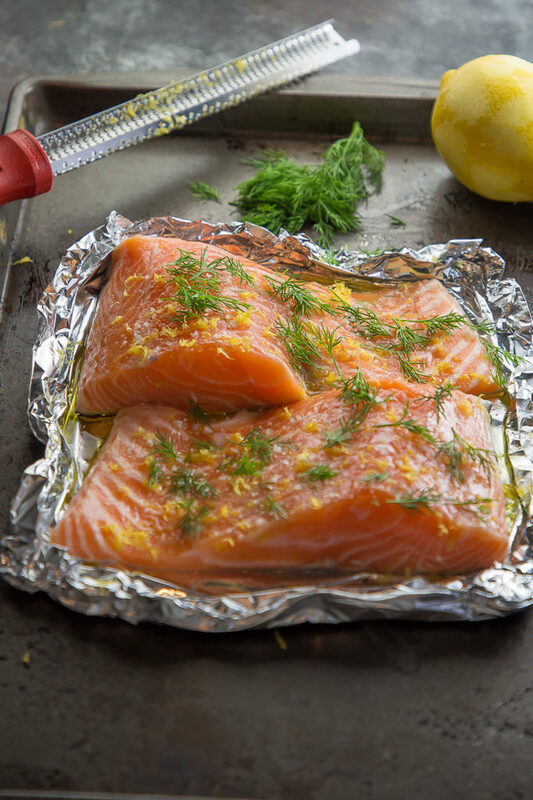 I love lemon and dill – such great flavors to pair with salmon! I haven’t made Salmon in such a long time. I need to try this recipe because these rice bowls look too good to be true! I am very impressed reading about Alaska Seafood Company. They are the kind of company that deserves support. We love rice bowls for just about everything! My husband would be all over this dinner! Simple and delicious this is my kind of dinner! The salmon looks perfect and I love the herbs you used, so much flavor! This brings me back to my days working in Alaska. Nothing better than fresh fish simply seasoned with lemon and dill. Love this recipe! I love salmon! To me it is both light and rich at the same time. Lemon and dill are the perfect pairing! Yes, it’s so bright and fresh tasting I LOVE the pairing! This will be my next salmon recipe to try. It I’ve never had a salmon rice bowl, but it looks like something my whole family will enjoy. We love lemon and dill on fish. I hope you all love the rice bowl as much as we do! That salmon looks so thick and wonderful! The color!!!! I really enjoy a good salmon dinner, and I can’t wait to try the rice recipe in my Instant Pot! Super simple and so fresh tasting with the lemon! I love salmon! We eat it once a week and get it from the organic farmers market. So true that people think all fish is create equal. I saw something about farmed fish and it changed the way I buy and consume it. Thanks for spreading the word. Oh my heavens Leslie, that salmon look divine! I love that you paired it with kale, too. 🙂 It really is tasty! I try to sneak kale into most meals somehow. My son loves it!